From the Hancock County Courthouse, travel southwest on Hwy 22 for approximately 7.3 miles until you come to Pearson Chapel Road on the left. 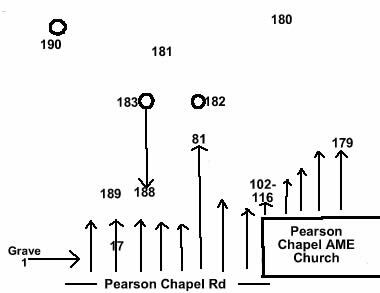 Turn left onto Pearson Chapel Road, and go 3.3 miles. The cemetery and church are on your right. The front part of the cemetery is mowed and accessible. In general the front part appears to be more recent burials. The back part of the cemetery is covered in tall grass and briars and appears to have many depressions and rocks marking earlier burials. It it difficult to determine the number of unmarked graves in the back part. Numbers on the map correspond to numbered graves and their locations. Arrows indicate the order of the grave numbering. Graves numbered 200 or higher have been added since the original survey and are believed to be somewhere in the cemetery. Scattered rocks could be graves. A child-sized grave with a headstone and footstone of rocks. "J. C. Baby" handwritten with no dates. Unclear if date of death. Last name probably Pearson, but is spelled "Person". Age 69. Last name unreadable. Dates very difficult to read. Birth year unreadable. Is a double slab with Mamie Kate Primas. Is a double slab with Tom Primas. "A Virtuous Woman" "Lawrence" on headstone. A slab one and one half sized. Age 64. "We will meet again" Graves 98-101 are inside a fence. "A little time on earth he spent till God for him His angel sent." Stone broken. Graves 98 to 101 are within a fence. Graves 102-110, and 112-116 are small pillars with crosses. Possible brick grave on incline. Day of death difficult to read. All info per funeral home marker. In Loving Memory. Photograph on grave. A metal marker next to an unmarked adult slab. Name per funeral home marker. Death day difficult to read. 2 depressions toward the rear of the open field. Scattered rocks and depressions indicate 20 to 100 graves in this open area. Asleep in Jesus, Blessed thought. The three rings of the Oddfellows on gravestone. Died 19. Unclear if 19 is age or century of birth or death. Name very difficult to read. Age 29. Asleep in Jesus. Grave not found in 2003. All info per Kimbrough listing. Not found in 2003. All info from Kimbrough listing. Age 64. All info from obituary.